The funding from the Petfinder Foundation was used to provide medical care for a dog in our shelter, Sadie, who had large masses on her abdomen, masses that we were unable to address in-house. 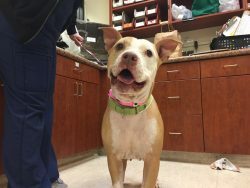 This grant gave us the ability to seek outside medical care to remove and diagnose cancerous abdominal tumors that were not only detrimental to Sadie’s health, but were also preventing Sadie from being spayed and therefore from being eligible for adoption. 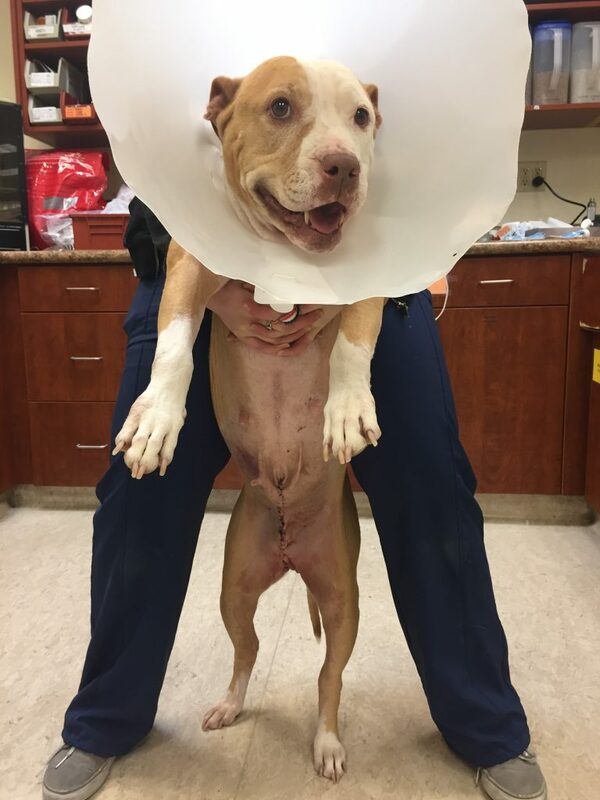 This grant helped us provide medical care for Sadie, a 3-year-old stray pit bull who arrived at The Animal Foundation in early October 2018. Although Sadie was an otherwise healthy (and happy!) dog, we discovered that she had large masses on her abdomen. The masses were concerning for health reasons, of course, but also because they stood in the way of Sadie being spayed and therefore becoming eligible for adoption. It’s our policy that all animals adopted from The Animal Foundation are spayed or neutered before going home. We didn’t want Sadie’s health to be compromised or her wait to find her forever home to be prolonged. 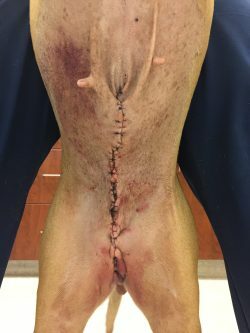 The Animal Foundation doesn’t currently have the resources to provide the surgery that Sadie needed. 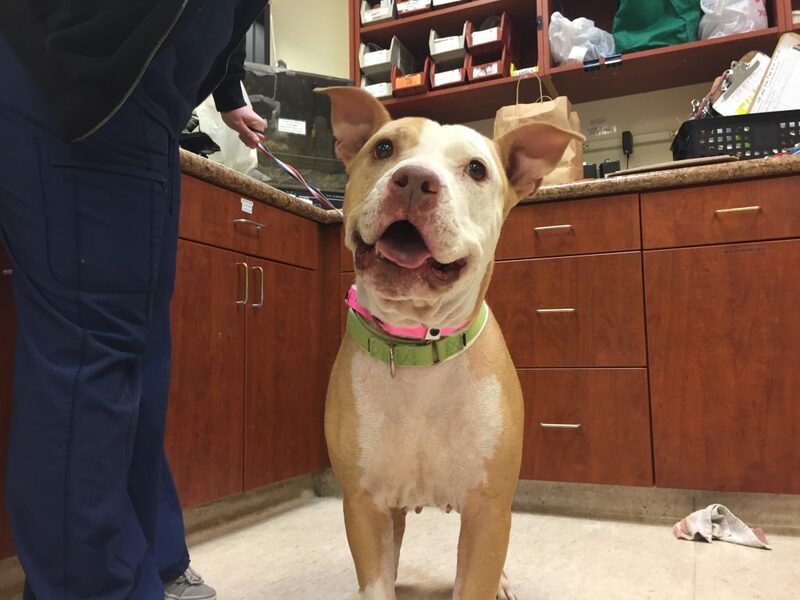 With the generous funding from the Petfinder Foundation, we were able to arrange for Sadie to be seen by veterinarians at a partnering hospital, who removed the masses and at the same time spayed Sadie. The masses were biopsied, and the results showed that one of the masses was a malignant skin tumor that is induced by the sun. Although the tumor might reappear later, her life expectancy and quality of life should not be significantly affected. Sadie stayed at the hospital for three and a half weeks until she finished recovering from her surgery. She returned to The Animal Foundation on Dec. 5, 2018. It didn’t take long for this happy-go-lucky girl to be discovered by her new family: She was adopted nine days later on Dec. 14. Her new mom reports that Sadie is doing well — she’s physically healthy and enjoying life in her new home. Her favorite thing to do is play games with her dad in the back yard. Thank you for helping us help Sadie!